The global implications of climate change have transformed our responsibilities as scientists. Both mitigation and adaptation require a deeper public understanding of climate science. I have worked as a researcher in weather and climate for 40 years. There is a long-held view that science will lose its integrity, and scientists will lose their impartial reputation, if scientists stray into the domain of public policy. This doctrine can be quite comfortable for scientists because it limits their personal responsibility to their technical field of expertise. It can also be comfortable for those in the policy arena because science often presents evidence that can be perceived as a threat to vested interests. Global climate change presents a clear challenge to this paradigm. Human civilization is strongly dependent on both natural and managed ecosystems, which in turn are directly dependent on the Earth’s climate. Now greenhouse gases from global industrial society are increasing global mean temperatures [Intergovernmental Panel on Climate Change, 2008], with dramatic long-term ecosystem impacts. This challenges many traditional human-centered political and economic ideologies and their implicit authority because managing the Earth system now requires limiting our greenhouse gas emissions. I believe that Earth and ecosystem scientists have a broad ethical responsibility for the future of the Earth. As a matter of scientific ethics, it is our responsibility to present the uncomfortable reality of a complex Earth system, whose stability is now threatened by both human industrial society and ecosystem destruction. The fate of the Earth should not be left to a struggle between lobbying and advocacy groups who have other agendas and a rather limited interest in the integrity of the science. Our democratic political system needs to hear from many voices, including those who understand the science of the Earth and its ecosystems as well as the many who understand the profound moral issue of our responsibility for the future of the Earth. We must seek ways to broaden our collective understanding so we can make collective as well as individual decisions to change direction. Scientists have a responsibility to communicate clearly to the public, not just to their colleagues and to those in power in society. Without a much deeper understanding of climate change and the Earth system, citizens cannot see the need for change so they cannot support governments when they have to make difficult decisions to move away from “business as usual.” It is also true that science and society are interwoven. Money for scientific research comes from society and with it comes an obligation to share what we learn with society. But scientists have the responsibility to both humanity and the Earth to look deeper than society’s agendas and tell the truth as far as we know it in all its richness and complexity. So how can we explain climate science to the public, the business community, farmers and foresters, and professionals in state governments in ways that are easily understood? In Vermont, I write nontechnical columns (Betts, 2008, 2009, 2010: available from http://alanbetts.com/writings) for two state newspapers, give commentaries on Vermont public radio, and give talks to a wide range of public groups and schools, covering the broad issue of climate change using a holistic framework. I present the global picture of a warming climate driven by the increase in man-made greenhouse gases and amplified by increasing water vapor and reductions in reflective snow and ice cover. But I teach climate literacy using local climate processes. The seasonal climate transitions (Betts, 2011a) at northern latitudes, linked with the winter, spring, summer, and fall seasons, are familiar to the public; but the underlying climate processes (water vapor feedback in all seasons, snow-ice albedo feedback in winter, and evaporation-precipitation feedback in summer) are not generally understood. So they can be used to explain climate feedback processes and the distinct roles of the three phases of water (ice, liquid, and vapor) in the surface energy balance and the coupling of the water cycle to vegetation. Through them, the perceptive observer can relate their experience of the seasons to key climate change processes which operate locally as well as globally. I have also been developing climate change indicators [Betts, 2011b] for Vermont that are familiar to local communities. These provide a framework for relating local and global trends and for discussing how to distinguish climate trends from interannual variability. In the northeast, temperature trends are twice as large in winter as in summer and spring is coming earlier [Hayhoe et al., 2007]. The cold season is shrinking, while the growing season for frost-sensitive plants has lengthened by nearly 4 days per decade [Betts, 2011b], with the last frost in spring coming earlier and the first fall frost coming later. Leaf-out for lilacs in spring has advanced 3 days per decade. The freezing of small lakes provides a good integrated measure of the reduced severity of winters and the shifting seasons. Fall freeze-up is coming later and ice-out is coming earlier in spring by several days per decade. 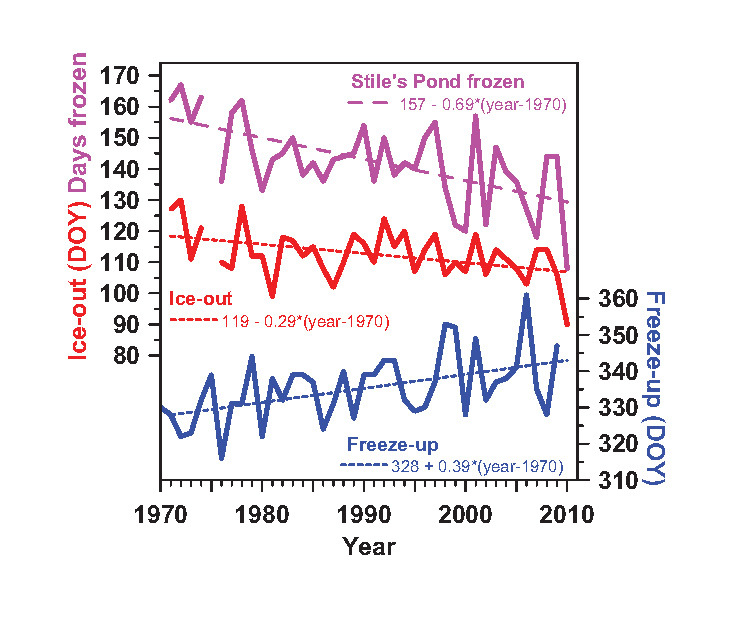 The combined effect is that the lake frozen period has shrunk nearly 7 days per decade for the past 40 years [Betts, 2011b] (Figure 1 below). These trends are familiar to local communities and clearly show the current nonstationarity of climate. The trends in recent decades broadly match climate model projections for the coming decades so they give complementary guidance for adaptation planning. Earth scientists face a profound ethical challenge. Humanity is an integral part of the Earth’s ecosystem, but the waste from our industrial society is now driving rapid global climate change. What is our responsibility as a community of scientists? Is it simply to follow tradition and explore and discuss in our own world, largely isolated from the broader community, the many interesting facets and complexities of the transformation of the Earth’s climate system and then to publish our results in our private jargon in copyrighted journals that are not freely available to the public that is funding us? Surely this is for us just “business as usual,” an integral part of the problem not the solution. I suggest it is time to reconsider our responsibilities to society and to the Earth. Humanity will be unable to deal with climate change, both in terms of mitigation and adaptation, until a broad spectrum of society is fluent in discussing the issues and the choices we face. Changing the direction of our global society from its present unsustainable path is a moral and ethical challenge as well as a scientific one. However, broad understanding of the limits imposed by the Earth system is essential. Clear, open communication and discussion is needed at all levels of society, along with research directed to clarifying the limits for decision makers in local communities. The contribution of science, honest communication of the state of knowledge, is needed to inform and counter the simplistic ideologies that are common in politics. I conclude that scientists need to become more deeply embedded in society. We all face the essential task of reducing human impacts on the Earth system. Alan Betts is supported by the National Science Foundation under grant AGS-0529797. Hayhoe, K., et al. (2007), Past and future changes in climate and hydrological indicators in the US northeast, Clim. Dyn., 28(4), 381–407, doi:10. 1007/s00382-006-0187-8. Intergovernmental Panel on Climate Change (2008), Climate Change 2007: Impacts, Adaptation and Vulnerability: Contribution of Working Group II to the Fourth Assessment Report of the Intergovernmental Panel on Climate Change, Cambridge Univ. Press, New York. Fig. 1. Freeze-up and ice-out day of year (DOY) for Stile’s Pond, Vermont, and number of days frozen. Adapted from Betts [2011b].